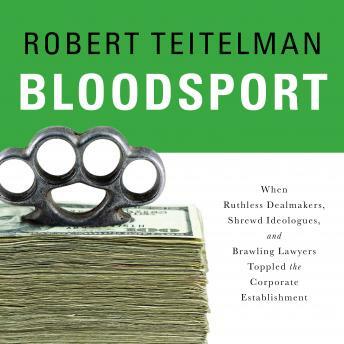 Bloodsport is the story of the creation of America's deal culture and the battle for control of America's corporations. Told through the fascinating, complex, and often-flawed characters who created a new era, it begins as the '60s are ending with the rise of the conglomerates, those vast assemblages of corporate assets. It rolls through the crisis-wracked '70s and the birth of the hostile deal, then careens into the '80s, when the deal culture of mergers and acquisitions is truly unleashed. The '90s see backlash, retrenchment, and rethinking. The new century brings bubbles and deregulation, ending in disaster. And following a quiet period after the financial crash of 2008, we are witnessing the full-throated battle once again. Since the first hostile deal in 1975, mergers and acquisitions have set off a revolution in who controls and governs American corporations. The rise of the deal raiders ushered in a world where literally no company was safe. Year after year, blockbuster deals unfolded. Many were hostile, most were complicated, and the majority were dead on arrival. Together, they tell a story about money and power and the creation of a new era in business.